I am unrepentant. Julie sent me this link, I liked it, I bought it. 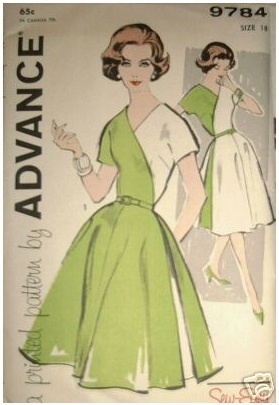 How often do you find dresses like this (and in a size to which I will have to perform minimal alterations, if any)? In my plan, we are NOT beltless. 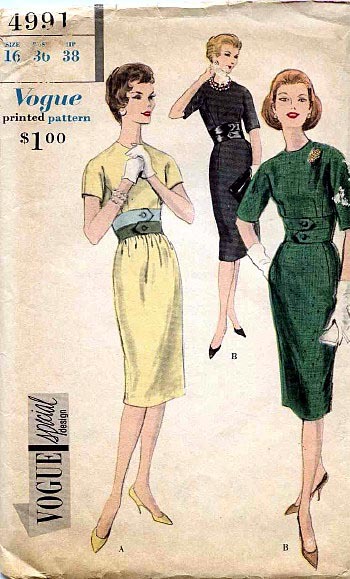 Whichever color combination you make (and note I am not suggesting prints here, although a black dress with the belt made in two differently-scaled houndstooths would be, well, freaking AWESOME) the pattern is $14. 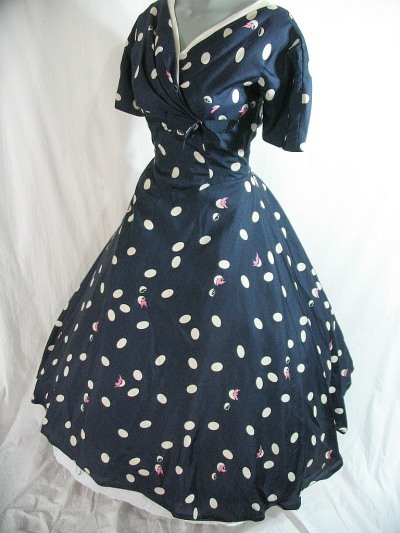 Somebody go buy it before I break down and figure out how to sew patent, okay? 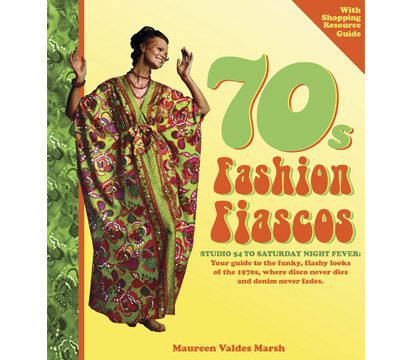 Regular reader Maureen (also known as Vintage Grace) has a new book out, about that time of wandering in the wilderness known as "1970s fashions". And she gives us a shout-out in the blogliography, so thanks, Maureen! I have to admit that, in paging through the book, there were occasions when I thought my eyeballs were going to melt away and drip down my brainstem. 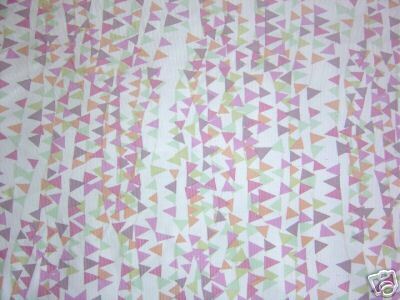 I mean, I love patterned fabrics, but there are patterns, and then there are seizure-triggers. Which was actually reassuring, in a way — it's nice to know that even I have limits. The book's available here, of course, or click on the image above to check out the book's website. A little something Julie hatched up for you. Thanks to Julie, who sent this to me, overcoming her own natural modesty (it's her listing). She knew I wouldn't be able to resist a dress like this. See it now? The little pink birds hatching from the eggs? So adorable. 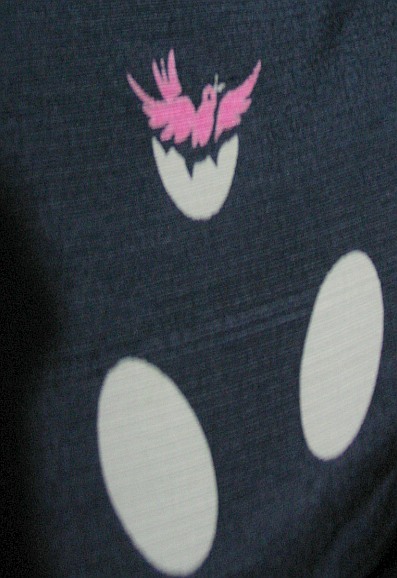 This is, in fact, the best bird-themed novelty fabric I've seen since the crows with megaphones. In fact, I live in hope that as the Internet-era allows us spread out across the plain of available information, we'll make more and more links between things. Before I die I imagine that I'll be able to google up someone's lovingly-constructed webpage that is nothing but links to samples of bird-themed novelty print fabric. And each of those samples will be linked to some instant-fab that will produce yards and yards for you, on demand, in any colorway. Oh, can you tell that I am a firm believer in the coming culture of fab(rication) and the long, long, long, long tail? I love old magazines (I also bought an issue of Life for some nefarious purpose that I will not yet reveal). I also got a SIGNED copy of Mitford Mathews' Dictionary of Americanisms, a book for my little boy, and something from 1891 that seemed hilarious, so I bought it. Where did I find all this glory? Well, the Regenstein Library, of course. (It was book sale time!) I love the Regenstein. I don't know exactly why, but I think it has something to do with the idea that every time I go in there I learn, not just something I didn't already know, but something I DIDN'T EVEN KNOW I didn't know. That, to me, is what a library is. And the Chicago libraries, I think, are better than most [disclaimer: I am on a U of C library committee, which is kind of what being a football booster would be at any other school], in that they think beyond (as it was described to me) the "cathedral of books" model. A cathedral of books is very beautiful and inspiring, but if you are going to have a knowledge religion you probably also want to go out and minister to the information-downtrodden, the information-hungry, and the information-poor, and that's what they do. Every time I go there I come out refreshed, which, come to think of it, is exactly what going to church is supposed to make you feel, right? 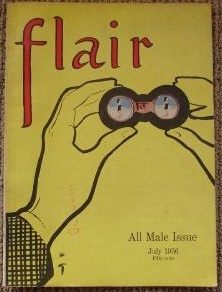 One of those issues of Flair has a white, fake-fur, strapless evening gown in it. Too bad it's only an illustration … there was also a $250 HarperCollins/Rizzoli book of The Best of Flair a couple years back. It's still going for about $125! Isn't this a lovely pattern? 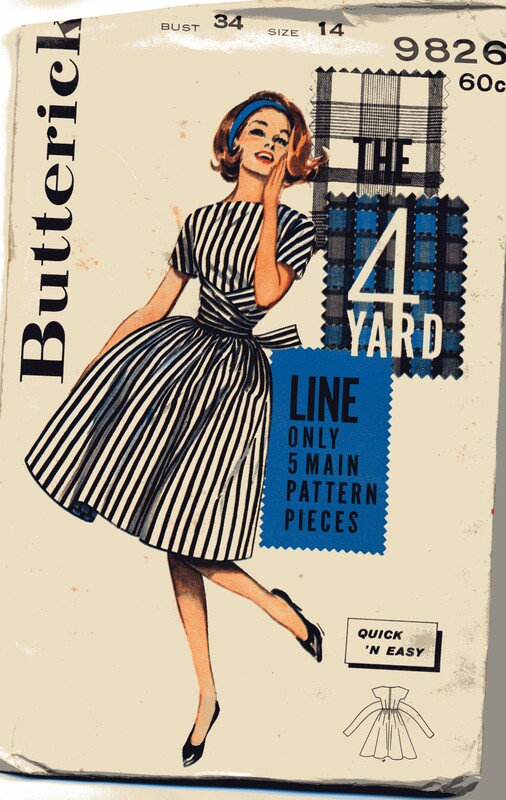 I love the stripes, obviously, and I love the weird football theme of this particular pattern line (I saw a couple others online, all with the 'four yard line' slogan.) Sarah sent this one to me, along with several other gorgeous and/or funny ones. Why? Just because. She had them, wasn't going to use them, thought I would like them, so she sent them along. Just like that. I am continually surprised and gratified by the enormous generosity of Dress A Day readers. Not just in the comments, where you help me and each other with links and information; or in the links that you send me to share; but also in the packages you send me! Lately I have been dissatisfied with my underwear. Well, actually, just with the slips. They have been uncooperative, to say the least, and occasionally downright recalcitrant. Not the gorgeous vintage full slips (like this one, click on the pic to visit the eBay auction), the ones I found a whole mint new-with-tags lot of a couple years ago — those are fine, content to be used as nightgowns and to occasionally have a day out under a dress. It's the half slips that are giving me trouble. Well, the half slips and the tights, who together are having a little static electricity festival that Must Be Stopped. Not to mention that the half slips are deciding, en masse, either to revolt against the tyranny of elastic or to join the low-rise movement, and so their waistbands are getting saggier and saggier. So I think I'm going to make some half slips. Heavy silk (from Thai Silks and Dharma Trading Company) are surprisingly cheap, especially in the quantities you'd need for a slip. I can find some nice lace trim, too, that will help weight down the bottom of the slip, and, not incidentally, look nice. Anyone have any slip-sewing tips, or sources for really nice lingerie elastic? I will make a followup sources and tips from the comments … and, with any luck, a picture of the slips I've made!